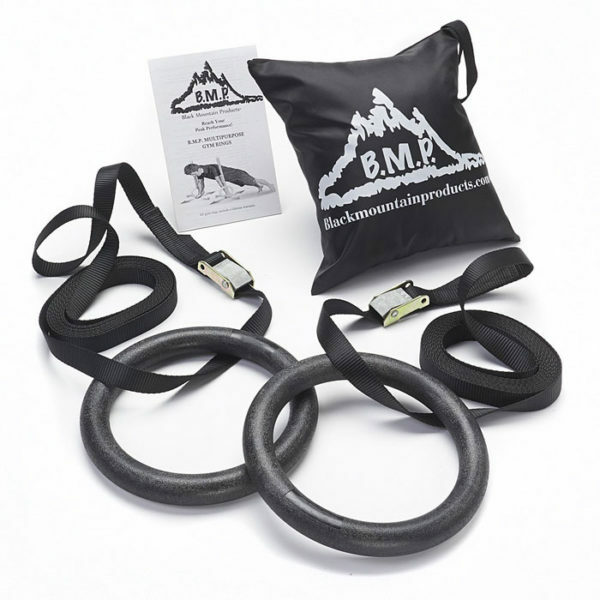 Black Mountain Products Gymnastics Rings are a great way to exercise your upper body, core, and increase agility. Plus they’re ideal for portable workouts at home or anywhere. Capable of holding up to 1200 lbs., they come with a 15 ft. strap for greater length adjustment. Black Mountain Products gym rings are professional-grade and are perfect for any fitness level. Rings are easily installed and removed. Holds up to 1,200 lbs. Extra-long nylon strap measures 1 in. x 15 ft. These rings from Black Mountain Products located in Illinois, are made from durable, easy-grip plastic and include the same made ring straps as most top tier olympic gymnastic rings. A good economical option for the garage athlete on a budget, BMP Rings have a standard 1.25” diameter and can be set up for indoor and outdoor bodyweight training in almost any condition. Use them for pull-ups, ring dips, front and back levers, scarecrows—any standard gym ring exercises. The grip feels very good in your hands- textured, but not to gnarly. They have a nice weight and denseness to them. The straps are super easy to setup, and they feel solid too. The provided ring straps and buckle system are ultra-durable, easily adjustable, and environmentally versatile. Whether you integrate a ring station into a custom home gym or swing the straps over a sturdy tree branch for an outdoor workout, there are very few limitations on where a set of gym rings can go. I can see these lasting quite some time & very pleased with this purchase. For $35 you have an all in one home gym to take anywhere when you travel. As you progress to muscle ups and higher olympic exercises these rings will challenge any athlete. My main critique is more of a preference than anything. From using many different rings at various boxes, I just prefer the classic wood rings. Not any particular brand, just the material wood feels better when using them. BMP does offer wood rings as well so be sure to check those out too! However, these are amazing rings for the value and I am sure some people will prefer the feel of these plastic textured rings over wood, then these are the rings for you.